In 100 Words: Without scuppering its aura of pre-adolescent magic, Mary Poppins prompts countless children to wonder, "What's a suffragette?" Spoonfuls of medicine help the sugar go down: even while giggling, kids detect vague chills of drunkenness, penury, bellicosity, and funereal capitalism, absorbing lucid premonitions of an imbalanced world. The visuals shift kaleidoscopically, stepping in time amongst Eastery softness, overcast sootiness, and a lapidary, primary-color brilliance, the latter echoing Mary's resplendent hardness. The compassionate disciplinarian and tap-dancing busker-laborer model the rich pleasures of jubilant friendship. The music, performances, and choreographies delight. The effects still dazzle. Mary glows, humbles, and warms, like a fire. Food for Thought: Mary Poppins helped kickstart the dramatic narrative of the 1960s roadshow musical's rise and fall, deliciously recounted at various scales in Sheldon Hall and Steve Neale's Epics, Spectacles, and Blockbusters: A Hollywood History (Wayne State UP, 2010), the Doctor Dolittle sections of Mark Harris's Pictures at a Revolution: Five Movies and the Birth of the New Hollywood (Penguin, 2008), and Matthew Kennedy's Roadshow! : The Fall of Film Musicals in the 1960s (Oxford UP, 2014). 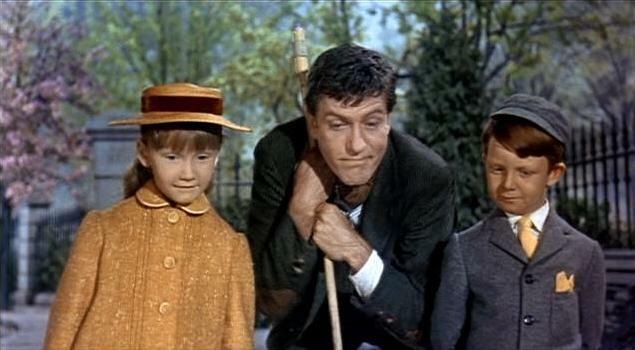 * Still, Mary Poppins is mostly contextual or peripheral in those stories. For direct treatments, many of them comparing Mary on the page to her onscreen avatar, check out Cristina Pérez Valverde's article "Magic Women on the Margins" in the December 2009 issue of Children's Literature in Education or Donald Levin's chapter entitled "The Americanization of Mary: Contesting Cultural Narratives in Disney's Mary Poppins" in the anthology Fantasy Fiction into Film: Essays (eds. Leslie Stratyner and James R. Keller, McFarland, 2007). Arguably the richest of these treatments, with the greatest ambition to situate Disney's Mary within its era of production, is Anne McLeer's essay "Practical Perfection? : The Nanny Negotiates Gender, Class, and Family Contradictions in 1960s Popular Culture," first published in the June 2002 issue of NWSA: The National Women's Studies Association Journal and revised for inclusion in Being and Becoming Visible: Women, Performance, and Visual Culture (eds. Olga M. Mesropova and Stacey Weber-Fève, Johns Hopkins UP, 2010). And I couldn't possibly open my umbrella and fly off without tipping my hat to Brett Farmer's wonderful 2007 Camera Obscura essay with the self-explanatory title, "Julie Andrews Made Me Gay." * I have never met Matthew Kennedy in person, but he's been a very kind correspondent to this blog, and wrote entrancing biographies of Marie Dressler, Edmund Goulding, and Joan Blondell that you should also track down.